Cure-for-it-all, photographed at John U. Lloyd Beach State Park, Marsh 2015. Other photographs at Hugh Taylor Birch State Park. The name suggests how important this plant is in some parts of the world. In other places, however, it's a major pest. Cure-forit-all, Pluchea carolinensis, is that kind of plant. Even whether it is a Florida native stirs debate in places where such things matter. According to the latest United States Department of Agricutlure distribution maps, Cure-for-it-all, can be found in Florida from Broward County southward, and also in Marion and Pinellas counties. Hawaii is the only other state where it grows, and there's no doubt it is an introduced plant. It's native to the Caribbean, including the Bahamas, Central America and parts of South America. 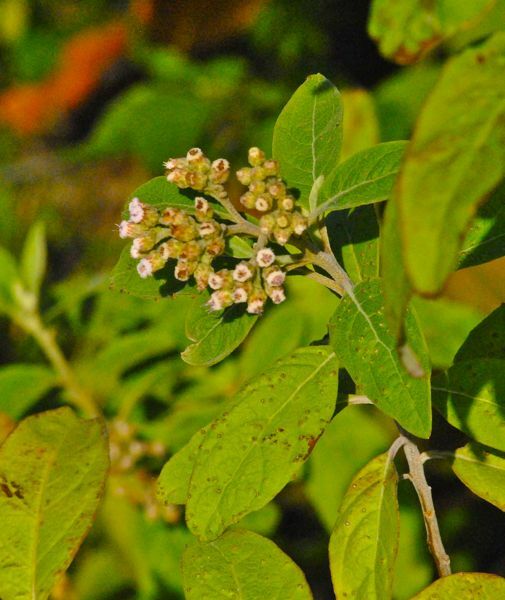 The USDA calls the plant sourbush and classifies it as a native. Noted Florida naturalist John Kunkel Small considered it introduced from tropical parts of the hemisphere and others came to a similar conclusion. Delray Beach's Institute for Regional Conservation says the "weight of opinion" comes down on cure-for-it-all being an introduced plant. The definition of a native, by the way, is any plant here before the first European explorers arrived in Florida. It is a shrub, usually between three and six feet tall but can hit 10 feet. The leaves are oval-shaped or elliptical, smoothed-edged or with fine teeth. When crushed, the leaves have a turpentine smell. The flowers, which bloom from late February to June, are pinkish but can be purple or white. Seeds are wind-dispersed and are able to colonize an area if they find the right spot — bare, moist soil. It's found on the borders of hammocks, along roadsides or recently cleared fields. 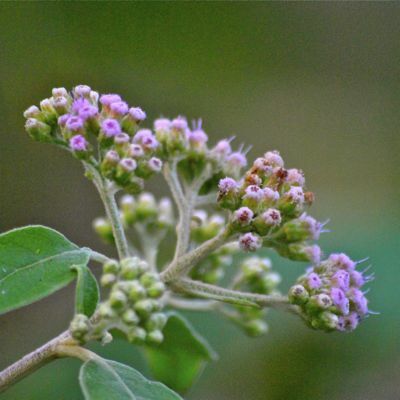 In areas where it's native, cure-for-it-all is used to treat a long list of ailments, including malaria and uterine fibroids. According to the USDA, it's used to control fever, relieve sore throats and stomach problems and as an analgesic. It's used in poultices for wounds and skin ulcers. Laboratory research with rats confirm the plant has analgesic and anti-inflammatory properties. But cure-for-it-all is also a problem plant, particularly in parts of Asia and the Pacific, where it's considered an invasive. It is an aggressive plant, quickly colonizing open areas and forming thickets that block out native species. How it got to the Pacific in the first place is a bit of a question, but researchers have noticed a correlation between its presence and the sites of World War II air bases throughout the region. Even its some of its common names show the mix of opinions about this plant: sweet scent and stinky fleabane. Really. 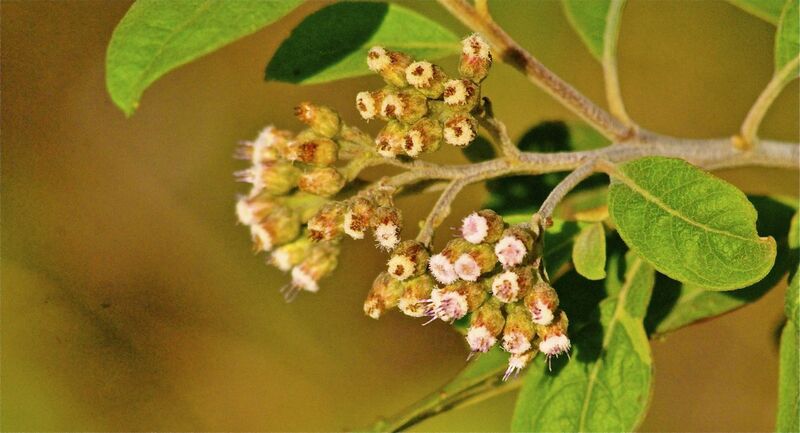 Others include: cattletongue, curry plant, pluchea, shrubby fleabane and wild tobacco. It is a member of Asteraceae, the aster family.